On BLM's N. Cow Mtn near Ukiah CA there is a place called the Willow Creek Recreation Site. Its a fancy name for a parking area and trail head. From this trail head you can hike two different trails. The main trail from this point is called the Mayacmas Trail. Just about one mile from the parking area is a seasonal waterfall that is about 25' tall. Near the waterfall someone has done some trail improvements, put in steps, a rock wall and a bench. Its a great spot to sit and enjoy nature. Another trail named Valley View splits off the Mayacmas Trail and like the name implies it has some great views of the Ukiah Valley. Like the Mayacmas Trail someone or group at some point in time has put a lot of work into the Valley View Trail including three benches placed along the trail. Due the the great views, the waterfall and the relative isolation just a few minutes from town, I have become a frequent visitor to this area. During my visits over the last 2 years I had experienced an access issue during the winter months. Like I said, someone had put a lot of work into this area. One project that had been done was a footbridge across Willow Creek adjacent to the parking area. I'm guessing that many years had passed since the bridge was installed and nature had done what nature does. Who knows exactly how it happened but I'm thinking it went something like this; a tree fell downstream of the bridge this allowed for some debris to accumulate, eventually some silt settled and some bushes started to grow. With the flow in the creek restricted more and more silt acclimated until the bridge became a dam, water then flooded the area creating a swamp making the trail impassable during winter months. So now during the winter or as long as the creek flows, the seasonal waterfall and both trails are very difficult to access from the Willow Creek Recreation Site. In my job one of my duties is Explorer Adviser. I'm guessing your asking what does that mean. Well Explorers are young men and women between the ages of 14-18 who are interested in the fire service. Explorers train to the same standards as career firefighters. They ride-along in fire engines and ambulances. They assist fire personal with real emergencies including medical aids and fires. Of course for legal reasons there are a few restrictions on what an Explorer is allowed to do, still Explorers get many opportunities to participate in the delivery of emergency services. Explorers gain valuable experience for a future in the fire service, many of our explorers have gone on to become firefighters, paramedics and even flight nurses. One part of the program is preforming community service. A few weeks back I learned of an upcoming event, National Public Lands Day. It's a day dedicated to improving public lands across the country through volunteerism. So I have a project and a group of people who preform public service, perfect! I contacted BLM and they thought it was a great idea. I had to jump a couple of insurance hurdles, thankfully everyone saw the benefits of the project and we where able to satisfy all sides. One hurdle did remain, Explorers can not use chainsaws. Well a Captain with CalFire Ukiah Station heard about our project and thought it would be a great opportunity for his crew to get some chainsaw practice. Everything was falling into place nicely. 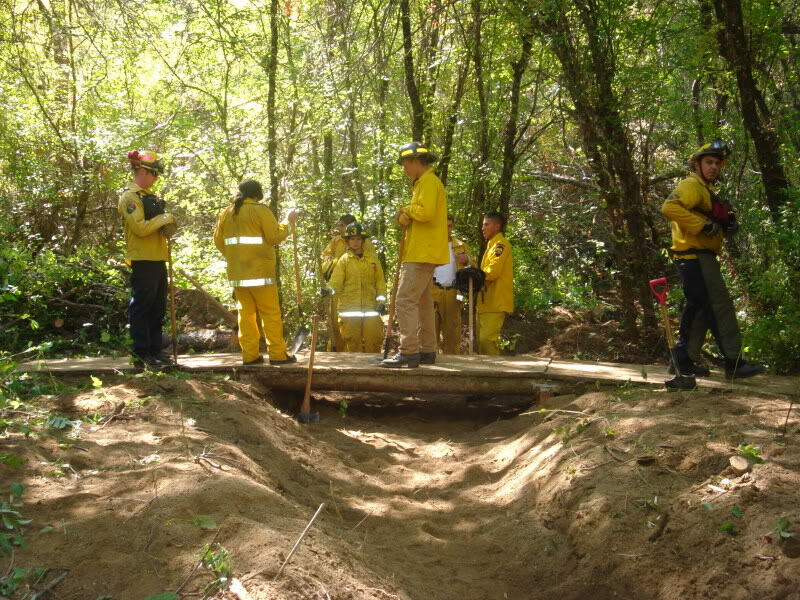 On 10/3/10 the Ukiah City Fire Dept Explorers, CalFire Ukiah Station E-1165 and the Ukiah Fire Dept participated in a work project at the Willow Creek Recreation Site. The group picked up two pick-up truck beds worth of trash, mostly shotgun shells and the various items used as targets. After that one group worked on clearing and widening the trail to the bridge. The CalFire crew went to work clearing fallen trees and bushes that where clogging up the creek. They where followed by another group with shovels who worked to clear silt that had settled around the bridge. In all about 300' of creek bed was rehabilitated, returning the flow to the original channel. The group put in a total of 56 man hours of work. In addition to the benefits to the public by making the area assessable during winter months, the Explorers got to train in the use of hand tools, working together, physical activity and public service. CalFire was able to get some chainsaw training hours for their firefighters. There is still a little bit of work to be done. I plan on returning and spreading some straw for erosion control. We will need to see how our work holds up this winter and make repairs as necessary. In all the day was a great success and everyone had fun doing it. Some of the Explorers even started making sugestions of what we could do for our next project. I need to put out a big thank you to all thoes who indirectly helped form the staff at BLM to the staff at the City that helped with insurance, the City Fire Chiefs and the CalFire Battalion Chief. Once again thanks to all who showed up and put in the hours. Are you intrested in becoming an Explorer with the Ukiah Fire Dept - Young men and women between the ages of 14-18 can call (707) 463-6276 or come by the station at 300 Seminary Ave for more information.